Depending, I suppose, on where you live, you may or may not have noticed that there are thousands of miles of abandoned railway tracks in the world. Tracks and stations, above and below ground, sit there, silent and unused. There are many reasons for this. Train optimists point out that, yes, maybe this particular line is "disused," but that's only because it has been superseded by newer, sleeker and much faster train technology. That is true in many places in Europe. Italy, for one. The never-ending rapid-train construction in Italy is, in that respect, paying off. You can already get from Naples-home to Milan-home (650 km/400 miles), door-to-door, faster by train than by plane. Walk on, walk off; no searches, no endless waiting in airports. Also, the great increase in private automobile ownership and the corresponding construction of new highways in Italy has been spectacular in the last few decades, and the chaotic spread of urbanization does not follow the straight lines dictated by surveyors who laid out early railways. There are, as well, such things as bankruptcy, mergers, wars, disasters, and specially built trains for mines or other industry being taken out of service once they are no longer needed. And so on. Here are a few of them near Naples in the Campania region of Italy. The railway was slightly more than 26 km/16 miles long and had a life of only 35 years, opening in 1931 and closing in 1966. It connected state rail lines at the top of the Valle di Diano in the Cilento area of Campania with state rail service farther to the southwest and was meant to hook at least one station in the Campania region into an "all points south" network in Puglia, Basilicata and Calabria, the three southernmost regions on the Italian peninsula. The tracks had a gauge (the distance between the tracks) of 950 mm (which makes it "narrow gauge" compared to standard Italian national railway gauge) and was not electrified. The name of the operating company was the Società Mediterranea Calabro Lucane. To connect the national rail line at the station of Atena Lucana in the north to another station of the national rail line at Marsico Nuovo in the southwest, the new train climbed from the town of Atena Lucana at 455 meters (almost 1500 feet) above sea level and made eight stops, crossing the Maddalena mountain chain up to a height of 919 m/3000 feet and then descending a bit to end at Marsico Nuovo at 781 m/2600 feet. It was an impressive feat of engineering, involving the construction of bridges and helical tunnels so as to avoid having to build rack-and-pinion (or cog) sections (like a cable car) to overcome sudden and steep changes in elevation. It was never successful for various reasons; stations were too far from inhabited centers; there were a few landslides; etc., so tt was closed and dismantled and a bus route was put in to get over the mountain. In any event, very modern road construction and the increase in private automobile traffic have rendered this quaint train in the mountains unnecessary. As with many other such abandoned railways, at least some of the length, while not exactly reverting to nature, has been put to recreational use for hikers and bicyclists. The Sparanise-Gaeta railway (the blue line, right), also known as the Aurunci line, had a normal state railway gauge (1435 mm) and opened oi 1892. Sparanise-Minturno closed in 1957. The shorter Fornia-Gaeta section closed to passenger service and then to freight in 1981. It was first run by a private company, Mediterranean Railways and then by the state railway. The town of Sparanise (also marked in the large image above, upper-right corner is at the northern end of the Campanian plain. It sits at the foot of the Roccamonfina volcanic complex about 20 km inland, about halfway between Naples and Gaeta. The area is densely populated today and surrounded by a thick network of primary and secomdary roads, but that was not the case in 1879 when the idea first arose to connect the town to the coast and Gaeta. Construction started in 1890. 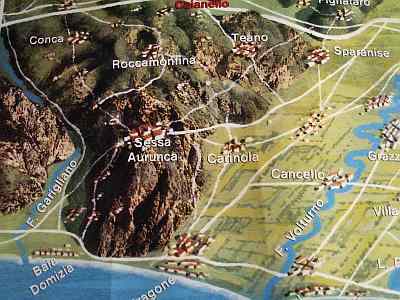 It started at a point that had been part of the pre-Unification (that is, before 1860) railway (red line, photo, top right) from Naples to Rome and then branched off to run along the base of the mountains and then over them to terminate at Gaeta. It ran a length of just over 59 km/37 miles along an impressive stretch of engineering, including the 25 Bridges, a series of elevated arcades forming a 400-meter-long span between Itri and Formia (pictured). The trip took from 2½-3 hours and less after the conversion from steam engines to diesel. The area was the site of intense fighting in WWII as the retreating German army, trying to block the Allied advance up the Italian peninsula, destroyed much of the physical plant of railways leading north, including bridges. The 25 Bridges were rebuilt after the war. Passenger service was suspended in 1966 over protests by the population. This railway had lasted for many years and provided a much needed service, only partially filled by bus service meant to replace it. There is constant talk of reactivating at least some sections of the old railway, and some work has been done. So far, no trains are running. A railway up to the top of Mt. 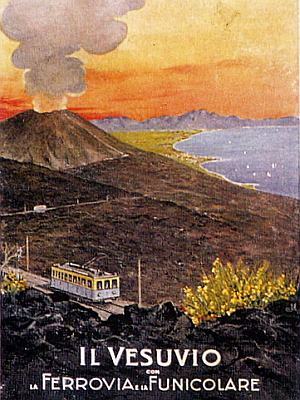 Vesuvius is, of course, not a train in the traditional sense of providing transportation for the commuter masses. It was designed to be—and indeed, for a while, was—a convenient way for tourists to get to the top of one of the most famous attractions in the world, one that could explode at any moment, and you really didn't want to miss that! Actually, the train did not take you to the top of the volcano, but it did take you from the mainline station at Pugliano up to the bottom station (at 753 meters a.s.l.) of the famous funicular, the cable car, (if you know the song Funiculì-funiculà, this is it!). The railway was built and run by Thomas Cook & Son. Their train was built in 1903; parts of it had to be rebuilt after the 1906 eruption of Vesuvius, and it closed for good in 1955. It was a 7.6 km-long narrow gauge rack-and-pinion track. It might even still be around if the powers that be had not decided to get rid of the cable-car. Thomas Cook's railway wound up having no place to go. The complete story is at this link. I am aware that around the world many major cities have closed some of their underground stations. Not just individual stations, either; some cities have "disused" entire stretches of stations. You may even be able to pay to take a look at these so-called "ghost" stations. That won't (not yet, anyway) happen in Campania because the only underground train line is in Naples and they haven't finished building it yet, so how can they start abandoning it? Although...although... some of the decisions they make on where to place these stations make them seem abandoned. See this link.